Chrysoprase is a green Chalcedony, a member of the Quartz group. It’s crystal system is hexagonal (trigonal). It is one of the rarest and most valuable of the Chalcedonies. It’s green colour comes from nickel, and it often occurs as nodules or in crevices in nickel deposit. Chrysoprase was used as gemstone in ancient Greece as far back as 400 B.C. and was mined in Poland since the 14th century. 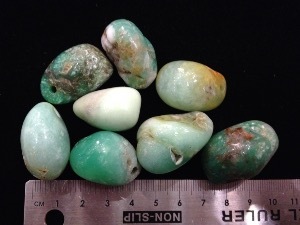 Current important deposits of Chrysoprase are in Australia, Brazil, Madagascar, South Africa and Russia. Chrysoprase is considered to be a heart-hearling stone, and is said to help one work through a host of emotional imbalances. It may help us release attachment to fear-based emotions, belief systems and actions. It is said to be an excellent stone for those who choose to heal form abuse, breaking the cycle of abuse for future generations. It may also be helpful in understanding the karmic basic for emotional patterns within relationships. 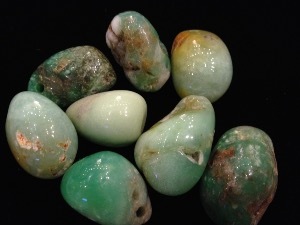 Physically Chrysoprase is said to support general healing and regeneration. Some say it’s the ‘stone of youth’, in that it may assist in maintaining a youthful spirit, outlook and energy. It may also be helpful in recuperation from degeneration diseases of all types. Here drilled Chrysoprase tumble stones, varying sizes, approx. 2.5/3 cm. One Chrysoprase tumble stone will be selected specially for your order, or alternatively why not come to the London Fossils and Crystals shop and choose your own.